I will take a rest until January. I will monitor my site for comments to prior blogs and will post those comments as appropriate. I wish all a Happy New Year. These missives come from residents of the York Neighborhood. I will not comment on them as I feel that they speak for themselves quite nicely. "Saturday night's snowfall brought out the York hooligans (students) en masse. Around 10:30 PM a large group of 25+ converged on Potter St. between Grant and Franklin for a noisy, aggressive snowball fight. Their numbers swelled as others, attracted to the melee, arrived from all directions; some armed with bats(baseball?) To me this presented personal danger as well as a threat to my property. I called 911 and requested immediate police protection. When I saw one of the males under my bedroom window, trespassing, I opened the window and yelled "Get off my property". This was met by the usual f--- you and a fusillade of snowballs thrown by him and his friends at me, my window and house. Fearing a visit by the police they quickly dispersed into the night. The police did arrive shortly thereafter. If anybody wonders why Western students are not welcome in our neighborhoods take a look at the behaviour they display. Aside from the usual drunken disorderly conduct, vandalism and illegally entering private residences etc. we are witness to their ability tof form a large group on any occasion. This presents a real riot potential especially when fueled by alcohol and drugs. The York Neighborhood is not a safe place for people living alone, senior citizens or families with children Who does this leave? STUDENTS. If Western does not own up to its responsibilities and keep them on campus, we might as well all move out and let them have the neighborhood (campus). Richard, please don't print my name." "The crowd had dispersed before the police arrived. Therefore, there was not contact by the police with them. No doubt they knew that I would call 911 after my altercation regarding trespass. Western students are in over abundance in this neighborhood and responsible for many of the problems here. These people were definitely not of high school age nor were they homeless. No, I can't prove they were Western students since I didn't card them. There have been several incidents in this neighborhood of drunken individuals either breaking in or entering unlocked doors. One was arrested in someone's living room stark naked. Stoned. The police talked the homeowner out of pressing charges. My neighbor across the street had their back door kicked in and found someone in their kitchen at 3:00 AM. They did press charges and he was convicted of malicious mischief and required to pay restitution for damages. Several other people I know experienced drunken students entering their homes. Unfortunately, they did not report this to the police. People are afraid to file charges or put their names to anything. I have not experienced any of the above, probably because I have a large dog. A lot of these kinds of issues go unreported because of fear of reprisals and targeting. I am waiting to see what comes my way after Sat. night. I am utterly fed up with B'ham, Western and the York neighborhood and look forward to the day I can move out." Click on the image to enlarge the map. This is an interesting plot of the addresses of WWU students throughout Bellingham based on 2005 data. Although the title at the top of the map indicates that these are student addresses, it is unclear if there are multiple students attributable to some addresses. There are about 4,000 "students" accounted for by the map according to the text boxes for each neighborhood. Since there are about 3,000 to 3,500 students housed at the campus, there seems to be a discrepancy of 5,000 or more students for whom there is no accounting. Perhaps all of those live in the county, be it Whatcom or, perhaps, Skagit. Maybe all 5000 or so use PO Boxes or home addresses in other cities throughout the Pacific Northwest. The figures suggest to me that there are are thousands more grouping at the same addresses plotted, a situation we have come to know as illegal rooming houses. In any event, the map demonstrates the "infill" produced by the university which took place with little planning and which continues in the same way. Could the university publish a map with the true, physical addresses of all its students so that the city managers and the city council become aware of the extent of the problem which is all too apparent to the citizens? The following was sent as a comment to a previous post. I found his presentation compelling and decided to post it as a blog entry. The writer lives on Wildflower Way near the city's Clean Green facility. "Thought you might be interested in the letter I sent the mayor the day after his "coronation". It is very similar to yours. I don't expect any response or action, just more study groups, steering committees and other useless meetings to defer responsibility away from those who seek to gain or regain political power. Great blog BTW. If I were home more often I would be knocking the door down at city hall. Congratulations on your recent election to the office of Mayor. For what it’s worth, my wife and I voted for you based on the endorsement of Brett Bonner for your campaign. To be very honest with you, except for Brett’s endorsement, we really didn’t see much difference in the candidates for the office. We are hoping you give us a reason to vote for your re-election in four years. Now that you have been elected, we are hoping you “hit the ground running”, particularly on issues concerning the neighborhoods in Bellingham that are being overtaken by irresponsible landlords and renters. Of course it’s no secret that we are talking about the student occupied boarding houses that have been proliferating in the city for years. We realize that you have a lot of issues to deal with, many of them fairly new on the agenda like the waterfront and inhibiting legal businesses from operating in the city, but this issue isn’t new, has been festering for many years and needs your attention now. It seems to me you have two choices in this matter. The first is to start enforcing a city code that has been passed by some past council and mayor. The second is to ignore, give citizens the run-a-round, make excuses and watch as good neighborhoods and good neighbors become enemies on an ugly battleground of turf wars. Allow me to expand this discussion to code enforcement in general. I recently received a letter from Kent Butenschoen, Department of Public Works, Street Division, City of Bellingham. He informed me that a tree that was planted during neighborhood development and required by the city, had grown over the sidewalk and was now a safety hazard. He also informed me that I had until December 13, 2007 to take action to correct this “safety” issue. I had the feeling there would be an “or else” follow up but the letter wasn’t specific. Now I certainly understand safety issues, but in this case, how can this be a safety issue when there is a constant and steady stream of cars parked under the tree, on the sidewalk by the rental neighbors I referred to above. No one can walk on the sidewalk to be struck by the tree to begin with. I have complained about this issue to the Bellingham Police Department in the past but nothing was done. Sometimes the vehicles remain on the sidewalk and under the tree preventing pedestrian traffic (including young children going to school) for days. FYI, the sidewalk is only on one side of the street so this is the only path to walk for the kids, unless they walk in the street. The “flyer” that was enclosed in the envelope with the “tree” letter also stated it was the City’s responsibility to keep weeds and vegetation out of the sidewalk. I’m the original homeowner and in the thirteen years of living here, the City has never taken care of weeds and other vegetation in the sidewalk. Either I or my wife does this. I would also note that my yard and property are meticulously maintained, including the tree in question. Since I travel extensively in my profession, I contract with a yard maintenance company to mow, edge, fertilize as necessary and maintain my yard in a manner which not only enhances my property, but the neighborhood in general. What is my reward for this? I look across the street, up the street and down the street at the WWU student “boarding houses”. We hear the loud parties, the banging of house and card doors at all hours of the night. We have a very hard time getting in and out of our driveway due to the excessive amount of cars, most parked illegally, around or in front of our driveway. We see the trash strewn about the yards and streets due to trash bins overflowing with party material, beer and booze bottles, beer and soda cans and general debris. We see houses that are not maintained, the structures collapsing in some cases with old unused furniture thrown out the front door. And we see yards not maintained, the weeds and dandelions’ growing and blowing all over the neighborhood. As bad as the appearance and disturbances are, the real insult is the response we get from the City. Our complaints and requests for code and traffic enforcement fall on deaf ears, but we get letters from the City about a beautiful tree that is harming no one. So is the taxpayer to assume that when there is an issue that requires action by the owner-occupier of a home, the city will enforce or fine, but where there is an issue that requires action by the city to correct the problem, the city will give us no action or answers? I believe that question deserves an answer Mr. Mayor. As I said above, welcome to the office of Mayor. But please understand this office is not ceremonial in nature. It is not an office designed to only serve those with political clout in the city. It is, in fact, an office that requires strong leadership by the occupant to ensure the average working, taxpaying citizen in this city is served as well as the wealth, the politically connected or the large student population that we seem to be bending over backwards to cater to. I look forward to seeing action on these issues and to see the leadership from you I voted for. There is yet another reason to give a harder look at illegal rooming houses in our neighborhoods – water and sewer bills. Unless you have metered water use, which is not the case with almost all single family homes, you pay a flat rate for water and sewer use. That rental house with 5-6 adults pays the same flat rate even though that single family home has been turned into an illegal rooming house, which is essentially a revenue producing business for the landlord. So, if you have an average sized family, your rates are the same as for that de facto apartment building. As the city council contemplates licensing landlords, it may well consider requiring water meters on all single family rentals within the city limits. While I have no direct confirmation that the individuals involved are students (I will leave that determination to the officials of WWU and anxiously await their report) a Google search of the names in the police report below associated at least two with the university. I have asked the university in a previous blog entry (click here) to sanction off-campus legal offenses by the students, however, I have had no response to my proposal. In addition, it may be instructive to look at the property management firm (Adams Property Management) which our York homeowner indicates is in charge of this house of questionable repute. The management’s website (click here) laudably announces that their rental houses are not party houses and then states “We have a 10:00pm noise curfew on weekdays and 1:00am on weekends (Friday & Saturday nights).” Excuse me? The Bellingham Municipal Code states that with certain exceptions, the noise ordinance is applicable 24 hours per day. (Check the code by clicking here) By offering its own version of a “noise curfew” this management company is providing a false notion to its renters. It would be better that Adams Property Management give new renters a copy of the relevant portion of the code. I do like the “two strikes and you’re evicted” tolerance level of Adams Property Management, however, it may prove interesting to know the number of times this rule has been applied. Perhaps the company can inform us of their enforcement efforts. Lastly, this management firm’s rental application allows the primary renter to specify up to nine additional residents of the premises. Doh! Officers responded to a loud and disorderly party. The investigation resulted in the following arrests: (A1) was cited by summons for disorderly conduct (loud party), furnishing liquor to minors, obstructing and possession of marijuana under 40 grams (A2) was cited and released for disorderly conduct (loud party), furnishing liquor to minors, minor in possession, and possession of marijuana under 40 grams (A3) was cited and released for disorderly conduct (loud party), furnishing liquor to minors, minor in possession (A4) was cited and released for disorderly conduct (loud party), furnishing liquor to minors, minor in possession, and obstructing See narrative for further details. (A1) was cited and released for minor in possession of alcohol by consumption. (A1) was cited for MIP. Officers responded to the above location for a loud noise complaint. Although growth is one of the main election topics this year, the effects of uncontrolled growth in the guise of illegal rooming houses has not been entirely absorbed by some of the candidates. Over the past several months, I have presented information from the candidates and our citizenry on this issue so that you may consider their responses as you vote. I am not endorsing any candidates as I want this blog to remain solely informational on the question of unplanned infill due to non-enforcement of the single family zoning laws. Nor is the proliferation of illegal rooming houses the sole question of importance in the election. Nonetheless, we cannot speak of managing growth and preserving the character of our neighborhoods without resolving the issue. I encourage you to fill out your ballots today! WWU and the Waterfront - Who Will House the Students? “Western Washington University’s campus committee, which is looking at waterfront options for the school, will host another public forum at 4 p.m. Thursday in the Communications Facility, Room 115. Doug Graham of STRATUS, a consultant for Western’s Waterfront Development Committee, will provide an overall update on planning and other work since the last forum, including progress in developing the academic, enrollment, space plans and potential development models. Also included will be an update of the overall timeline for waterfront development and a discussion of specific accomplishments to date. At its Oct. 12 meeting, WWU’s board of trustees heard a presentation from STRATUS and Portland developer Homer Williams about some varied and creative ways a waterfront can be developed. You can read the information provided by STRATUS at the WWU website (click here for the report). Such development calls for increased enrollment of Huxley College. Although some comments within the report suggest planning for retail and commercial facilities, “housing” is also mentioned, however, it is unclear for whom the housing would be built. If it is a case of condominiums with exorbitant price tags that are clearly not meant for students, then this presents a problem. Where does WWU intend to house these additional students (500 in one scenario)? Can the waterfront campus even accommodate housing for 500 additional students? The Zonemaven intends to keep his eye on planning for WWU facilities at the waterfront. For those of you who can attend the presentation on 1 November, the question of student housing should be a topic of conversation with STRATUS and WWU. While I was travelling the past ten days, an article by Tim Stewart, the Director of Planning for our fair city appeared in the Bellingham Herald. (click here to read the article). Although I have asked several times in this blog (click here and here and here) for comments from Mr. Stewart and the Mayor regarding control of the illegal rooming houses throughout the city, neither has replied in a substantial form. To his credit, albeit tardily, the Mayor did proffer remarks at a recent City Council meeting to the effect that the current city code on single family zoning did not rise to the level of “unconstitutionality”, a line of pap which had been fed to homeowners for lo these many years. Mr. Stewart’s article is the closest manifestation of a response from him to date, however, his words do not indicate an appreciation of the silent infill in the form of illegal rooming houses in areas specifically zoned single family residential (read low density). This insidious process has already changed for the worse the character of many neighborhoods but you cannot garner that from his comments. When will the Director of Planning speak to the issue? I received the following from an acquaintance who lives in the Samish Neighborhood. Admittedly, the information is anecdotal, however, it does suggest that some further investigation is in order. Actions by rental agents, such as described below, may fall outside acceptable ethical boundaries set by codes of ethics and licensing authorities. This is especially true if the individual is a Realtor ®. "Sometimes if you want to find the truth, you need to play Sherlock. I did a little snooping and discovered that some real estate and property management groups really “speak with forked tongue”, no matter what they say or present to our City Council! Here are three independent “samples” I took recently, within three blocks of each other (and my home). There was a rental I called about for my “bogus” WWU entering grandchild looking for a shared place to rent. I was told, over the phone, that “only 3 lease signers were allowed: (with co-signers), but that “they could sub-lease to others if they wanted”. I went to an open house and engaged the realtor about the benefits in purchasing the 3-bedroom home as a rental-investment. “Excellent!” was the answer and he proceeded to tell me that two doors away was a college rental (see first sample above) with four students. When asked how many renters were allowed by the City, he said he didn’t know. But, later he called and said “three”, and that “I could have more, if I didn’t tell anyone”. We also discussed thoroughly how to change the basement laundry room ½ bath into a ¾ bath and modify the bonus room into 1 or 2 more bedrooms. There is a smaller house for sale, just across the street from an “infamous” rooming house; the owner of 35 years is moving because of it and fears from retaliation (how sad)! When asked about the house (for my “bogus” single, professional daughter), I was told, “it would be a great house!” I asked about the area and was told it was zoned R-1 and in a very nice single-family neighborhood”. Interestingly, no mention of the rooming house across the street." When faced with a possible rooming house this year on my block, I wrote the owner and property manager (both had real estate licences) to warn them that any representation of the property as a rental, which contravenes the Bellingham City Code on single family residences, would lead to my complaining to the appropriate real estate association and state authorities for violation of the ethics code. I further stated that any representation of the property as a rental home for other than a single family would additionally contravene the covenants on the property which convey with the title. Ironically, the owner of the home is also the developer who wrote those covenants. To date, the property remains unrented. To determine if an individual has a real estate license, you can go to the Washington State Department of Licensing (click here) and run the name. Just the other day I ran across a weblog (Bellinghamstertalk) authored on 11 October by John Watts, the current city council representative from Ward 3, who along with Ms. Ryan, voted against the motion by Terry Bornemann last October 8th for a pilot project aimed at eliminating illegal rooming houses throughout Bellingham. Since John’s blog does not allow for posting comments (odd for someone who promotes dialogue), I will post my comments here. You can read John’s entire blog by clicking here (lest I be accused of cherry picking from his writing). You can post comments to my blog by clicking on “Comments” at the bottom of this entry. John did mention, albeit quite obliquely, my blog within his 11 October screed but did not provide a link. Well, I just gotta disagree – a lot. If you read my blog, you will find plenty of support for the contention that the issue is that of single family zoning code enforcement, i.e., the lack thereof, which produced the proliferation of illegal rooming houses in this city. Whether sinister or not, these rooming houses change the character of our neighborhoods enormously in spite of all the talk coming from present members of the city council, to include you, John, and the candidates for office of mayor and city council. Paradoxically and all too ironically, the mantra has been “preserve the character of our neighborhoods”, ad nauseam. Contrary to your contention that no solutions are presented, comments on my blog, from me and from my readers, do offer solutions. Click here to read some. Or here to read some more. Or here for more. Yet you accuse some unspecified persons (myself included?) in the following way “It is the worst form of demogoguery (sic) to just throw money at a problem like this and expect a favorable result. " I know of nobody who has suggested throwing money at this problem. Perhaps some solutions will require additional enforcement personnel or other funding, however, none of that has been decided nor offered in a slapdash, off-hand manner. We are, after all, talking about the well-being and future of the city. Not exactly a free ride. Although we need to license landlords for reasons having to do with the health, welfare and safety of our tenant population, this is not the answer to managing densities within our neighborhoods. All those plans for areas zoned this and that are not worth the paper on which they are written, if you do not enforce the codes. As our citizens cannot pick and chose the laws they want to obey, so our city managers cannot ignore laws which they deem too difficult or too expensive or too whatever to enforce. Candidate Bill Geyer presents some excellent information on ignoring the law in my blog entry of 23 September (click here to read his thoughts). “Let's also not forget the efforts that have already gone into resolving this problem, including the vigorous discussions held in 2004. Without those efforts, we would certainly have more than the six documented complaints that are on file for this year!” Surely your joking, Mr. Watts. You cannot be referring to that fiasco I attended at the Cruise Terminal which was hijacked by the landlords and eventually caused the city council to buckle, like a badly built bridge, to their wishes . And from whence comes the logic which connects that meeting to 6 complaints three years hence? The rule of parsimony suggests that the complainants had a more proximate cause for filing with the city, the existence of illegal rooming houses near their homes. See my take on the six complaints by clicking here. Let us also talk about the noise, litter, public urination, proliferation of illegally parked cars that you, John, call “scattered nuisances…relatively benign”. Were it so. Many streets here have multiple illegal rooming houses. With a 50% rental rate in this city, it stands to reason. I get reports of this from homeowners across the city. My street (a cul-de-sac) had four illegal rooming houses for more than four years, that is, one-third of the homes on a street with home values from $300,000 to $650,000. One house had constant, 24 hours-a-day, traffic in and out. One week it is a huge party at one house. The next week it is parking issues at two houses. The next time is an assault and property damage at another. Next time it is excruciatingly loud band practice all afternoon. The more illegal rooming houses, the more the problems. What does this say for the quality of life? What does this say for resale value of homes? What does this say for the character of the neighborhood? And what is John Watt’s answer to my readers, the public? “In the meantime, let's keep doing what we are doing now, but do more of it.” More neglect? More non-enforcement? More of what? Our city council candidates for Ward 4 recently sent these messages in answer to emails from Bellingham homeowners concerned with illegal rooming houses in their neighborhoods. "Thanks for your patience in waiting for my reply. This campaign has filled my every waking hour. I was in the Council chambers yesterday [8 October], for both the afternoon and evening discussions. The City Attorney says the numbers of complaints run less than a half dozen per year. I realize that this is a major issue for anyone that has a house full of abusers near your residence. The police say they respond to complaints of noise, litter, and other kinds of abuses. I suspect though that nuisance complaints don't rank very high against the car prowels (sic), minor loss burglery's (sic) and other non-felony crimes that they don't have the manpower to investigate. Also, it seems that if this problem is only a few cases per year, it seems that the City should be able to get after and pressure the offending land lords (sic) without having to create another bureaucracy that licenses all land lords (sic). I don't like the idea of having Codes on the books that are not being enforced. If you have a specific problem in your neighborhood, I hope you will not hesitate to bring it to the attention of the office of the City Attorney." "Thank you for taking the time to express your concerns regarding R1 zoning enforcement. You are far from alone in your concerns. I have been personally affected in my own neighborhood by the very issue you address. Indeed the home I purchased, and now occupy, was previously rented to seven college students. When my wife and I purchased the home, the neighbors were very relieved to see "mom, dad & the kids" moving into the home. Yet just down the block we have a party house with a history of noise, litter, structural damage, public urination and other assorted obscene activities. I stop short of calling the R1 zoning unenforceable. We really don't know if it is enforceable or not, because the law has yet to be challenged in court. Such challenges have proved successful in other jurisdictions. I believe it must be challenged here, because, in my estimation, a law on the books that is not enforced is worse than not having the law at all. It conditions the citizens to believe selective obedience to the law is an acceptable system. Might I suggest that you visit the online blog of [the Zonemaven] at www.zonemaven.blogspot.com. [He] has been diligently pursuing this very issue." You still do not appreciate the basic issue which is the proliferation of illegal rooming houses throughout Bellingham. Offered a simplistic response from the Planning Department, the Office of the City Attorney looked no further than the end of its legal nose in providing a technically correct but substantially misleading figure to the council to characterize the extent of the problem. Some members of the council and at least one candidate, unfortunately, accepted the figure without the slightest attempt at verification or contextualization. You can read my take on these “stats” on an earlier blog entry by clicking here. You hit the nail on the head. Nothing like personal experience to bring home the reality of the problem. Here are some additional reader questions and comments. Both originate from homeowners in the Samish neighborhood. I again invite the city leadership to respond. "As the time for voting grows closer I am wondering if you realize how important the issue of zoning is to many of the residents of this city. I am referring to R1 or single-family zoning and the lack of enforcement of that code in Bellingham. Now that Western is back in session our neighborhood is facing once again, increased problems with noise, trash, increased traffic, too many cars parked all over the street, late night parties and underage drinking, and other irresponsible behavior. I admit that it isn't just students that are wreaking havoc in our neighborhood. There are also homes rented to multiple residents who we don't believe are students, but create the same problems, drinking, garbage, noise, increased traffic, cars parked all over the place and unkempt yards. In either case the result is the same. The quality of life in our neighborhood has been compromised by the lack of the enforcement of the single family zoning law. A law that we have been told is unenforceable and unconstitutional. We find it strange that there is a law on the books that is not enforceable. Single family zoning should mean just exactly what it says. My rights as a citizen in this city should be protected and upheld. When anyone buys a home in a neighborhood that is zoned single family, they should be able to rest assured that they will not be faced with a neighborhood that becomes filled with rooming houses and all of the problems that go with them. If you are elected, I would like to know what you will do to protect my neighborhood and neighborhoods all over the city that are experiencing the same problems that our neighborhood faces. Will you address the problem and help find a solution or will you just ignore it as is currently the case? " "What has 2013, 1907, 1818, 1306 and 1127 all have in common? No, these are not dates of any importance. I keep seeing these numbers as I drive around my neighborhood. I suspect most of us see similar numbers in our neighborhood, too. My internal Enigma machine decrypted the answer for me; “they are the addresses of rooming houses with 4 – 6 young adults”! How has this happened? Have “ET’s” come to our single family neighborhoods, abducting us without our knowledge, injecting us with a serum that makes us complacent or fogs our reasoning, then returning us to live out our lives not caring what happens?!? I think not. They may have done this to our city leaders and even some of our Neighborhood Associations? If so, they seem to have done a good job! I suspect that the theme, “keep or enhance our neighborhood’s character” is running rampant in most neighborhood association comprehensive plans currently being developed. I would challenge anyone to say, with a straight face, that rooming houses keep or enhance the character of any neighborhood. Why is it that some have the strong attitude of “not in my neighborhood”, while also advocating “it’s ok for your neighborhood?” Why have the city leaders taken such a low profile position on this subject? Are there any candidates for mayor and city council with the conviction to lead on this problem? Please speak up and take a stand! We would all like to know before November 6th! - Since WWU indirectly (at best) creates this problem for the community, require that they provide a much larger percent of their enrollment with on-campus and affordable housing. - For the same reason as above, require that the WWU Security heavily augment the patrol and control of student rooming houses in our neighborhoods since the city cannot or will not do it. - Four to six non-related young adults living in a traditional single-family residence will use much more water than an average family. Suggestion: put all rooming houses on a metered water plan and charge them accordingly. Everyone’s water rates are most definitely inflated because rooming houses are not charged fairly. If motels are charged for water based on usage, why aren’t rooming houses? - Renting property is as much of a business as any other business in town. Why aren’t landlords required to obtain a COB business license like everyone else? They should also be required to pay COB business taxes if appropriate. These fees could be used to help pay for more inspection, surveillance and patrol of rooming houses." "I have a much better appreciation of the depth and seriousness of the problem now than I did several months ago. What I had thought to be an isolated problem appears to be systematic and widespread. If I am elected to the Council, I will work to hold the mayor accountable for upholding the law on single-family housing as well as noise/parking ordinances. It's basic law and order, as I have said in a written reply to [the Zonemaven]. Fortunately, both mayoral candidates appear to be quite receptive and aware of the problem, so I think this will not be a difficult charge. I will also support a landlord accountability ordinance, which the incumbent (Bjornson) has in the past resisted in favor of a voluntary system. I believe council member Bornemann will be bringing the single-family zoning issue before the city council very soon, perhaps this Monday, so we may see movement on the issue even before the election. We will have to watch and see, but I think Bornemann is serious; don't know about the other council members." Here is the latest comment from candidate Bjornson: " "
Bravo, but I suggest that you read the mayoral candidate comments in one of my earlier posts (click here). Mr. McShane has offered more waffles than the local IHOP. A quote from Lewis Carroll - "The time has come, the Walrus said, to speak of many things. Of shoes and ships and sealing wax, of cabbages and kings." And may I add on behalf of the Walrus, of illegal rooming houses. Dueling Danjos - Deliverance in Bellingham? "… As you probably know, [the Zonemaven] has been raising this issue with all candidates, and getting mixed responses. From my own perspective, I am not sure the existing law is unenforceable. If elected I intend to enforce this, and find out. In addition, this is an issue where the City and WWU need to work together to identify and then implement solutions. 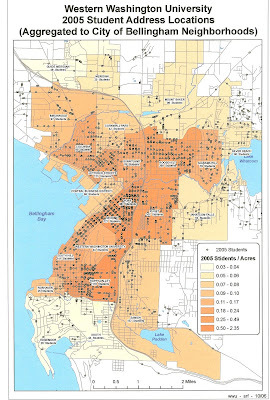 Some solutions could include the provision of more student housing by WWU, stricter permitted parking regulations and enforcement in problem areas (to reduce the number of cars allowed per residential address, thereby reducing the attractiveness of having 4+ students share a house), working with neighborhoods throughout the City to identify where zoning changes to accommodate student populations might make sense, possibly licensing landlords to make them more accountable for problem rentals. These are just a few of the potential solutions I will work on; I welcome your help and ideas in identifying and analyzing more. …"
"I am delighted that people are pushing this issue again. I am very well of the problem as my own neighborhood is heavily impacted and I know that the problem is growing. I do not believe that the law is unconstitutional as similar regulations have been enforced and survived challenges in other states. The way we manage this problem though does make enforcement difficult. Four years ago then Mayor Asmundson door belled my neighborhood and followed up with an effort to create a system where enforcement could more readily be done. Unfortunately the Council backed down from implementing the changes needed. I think it is in the City's interest to bring this back up. A number of very effective approaches have been developed in other college cities and I believe this approach would be the way to get at effective and timely enforcement. I also think it can be done in a very fair manner to landlords and to tenants and ultimately to the people that have invested in their homes and neighborhoods. Thank you for taking the time to ask and raise this concern. It is creating a groundswell that will about meaningful action on this long neglected matter." "Mixed responses"? Only from the candidates. My readers out there in rooming-house-land are not so divided. I agree with the rest of your statement as long as you keep enforcement of the current code at the top of your list. All other actions are tangential to the elimination of illegal rooming houses but will not get THE job done. A bit of a wooly response. You described the problem but did not propose a solution, i.e., enforcement of the single family zoning code. I have no idea what you are putting forward. "Bringing this back up" is too mushy. I reread your earlier response to me (click here) and found your answer equally unsatisfying. What is your stand? Silence Is Not Golden - Readers Comment on "Enforcement"
"I for one did not know there was a way to complain to the city about illegal rooming houses. At the time that I get more in my neighborhood, which I am unfortunately sure that I will, I will not hesitate to use this form. I will also provide my name so it will be considered a legitimate violation of the zoning law." "I was one of the six people who filed a complaint with the City Planning Department this year. I filled out a Code Enforcement Investigation Request, attached a letter giving a narrative of the kinds of municipal code violations that were happening at a rental property next to my home and how this was affecting my quality of life and enjoyment of my home. The kinds of violations ranged from too many unrelated occupants (6), problems with noise and parties, garbage not being disposed of properly, trash and glass being thrown in my yard etc. and so on. I also attached a list of the renters' names and phone numbers as proof of number of occupants living in the house. I talked about the problem with parking on my street due to the number of vehicles belonging to this house. I called the Planning Department to check on the complaint every two weeks and after five or six weeks I was told that the property owner had been notified, had responded and had been warned. I had filled out the enforcement request just before school was out in the summer, so by the time that the request had been investigated, that group of renters had moved out. The property was rented again in July to 3 renters and they have not caused any problems as of yet. My point in posting this reply is to encourage people to file these Code Enforcement Requests and to be clear in stating what codes are being violated and how it is affecting your quality of life. Attach any proof that you may have that the code is being violated. Then continue to contact the Planning Department for follow-up. Be persistent, be polite, be clear with your information. If enough people are willing to come forth we can show the city that we need some changes toward keeping our neighborhoods a great place to live. If we aren't willing to speak up no one will hear us." Again, for zoning enforcement (illegal rooming houses) you must make a written request to the Planning Department. Click here to find the form (Land Use Code Enforcement Investigation Request) or call them at 676-6550. For parking problems (cars parked on the wrong side of the road, in front of mailboxes, on the sidewalk, blocking driveways/alleys, etc.) call 676-6920 during weekdays. If the parking problem has safety ramifications, call 911 at any time. For noise complaints, call 676-6920 (or 676-6911 evenings and weekends). The noise ordinances are in effect 24 hours a day with several exceptions (e.g. construction). Read the code by clicking here. For abandoned vehicles call the police department at 676-6920. It is illegal to park a vehicle on a city street or city property for more than 24 hours. Read more on abandoned vehicles by clicking here. Since the City Attorney’s Office recently announced that the city, in the guise of its Planning Department, had received only 6 “valid” complaints regarding illegal rooming houses this year, I decided to verify this number. My call to the Planning Department revealed that, indeed, only six valid complaints were received to date, this year. However, there are problems related to using this number as a gauge of the extent of the spread of illegal rooming houses in the city. At least one candidate, Mr. Snapp (Ward 4 council seat), in his reply to a citizen’s inquiry, has already used the figure of six to soft-pedal the nature and extent of the illegal rooming houses. To understand the figure, it is important to know that the form (click here to see one) leaves it up to the citizen to characterize the complaint. If the complainant does not characterize his/her request as a violation of the single family zoning law, but says there is a noisy, dirty, rental house next door, then that complaint is classified as a violation of the noise or litter law. Additionally, the complaint cannot go forward if the complainant does not check one of two boxes related to confidentiality. One box indicates that the city can reveal the complainant’s name while the other box requests confidentiality with the proviso that, if the case goes to court, then the complainant’s name will be revealed. Any complaint form which has no petitioner named is also considered invalid. Since I have received several emails from concerned homeowners who are genuinely afraid to confront renters or landlords, it stands to reason that one might hesitate before indicating his/her name that may ultimately be revealed in a court case. Moreover, in order to characterize the complaint as a violation of the zoning law, one has to know that the current code characterizes a single family home with more than three unrelated adults as a code violation. Even candidate Snapp, in an early email to me said “I don't know where the ‘three unrelated’ term came from that (sic) is in the code?” (click here to read the code) Well, if we have presumably well-informed candidates for office who do not know that about the code, then we can infer that a private citizen might find it difficult to fill out correctly a form asking for redress. Therefore, if the city wants to use the volume of complaints received on a particular issue, it will have to be more circumspect on the subject of the process that leads to its determinations. If one uses a confusing or unclear process, one cannot base solid conclusions on the data thus derived. I call upon the Planning Department to provide detailed information on filling out the various forms and to post those instructions on the website. Three individuals spoke against action by the council on the landlord/tenant issue at the city council meeting on 8 October: Mr. Van Hudson, a representative of the Northwest Rental Owners Association; Mr. Aaron Lukoff, self-described as an attorney dealing in landlord issues; and Ms. Maggie Hanson, a landlord with 5 houses in Bellingham. I have synthesized some of the main points brought up during their comments to the council. Most of these issues have been discussed, in one form or another, in prior blog entries here, yet the myths continue. Unfortunately, many are perpetuated by the members of the city council. Myth #1: The problem is student rentals. The problem is illegal rooming houses, whoever the occupants are. The reality is that students comprise the largest number in a recognizable category. Group renters can also be young wage earners or low paid workers from the service sector. It is the large footprint of these rooming houses which produces the problem. Average single family homes simply do not have 5, 6, 7 or more adult occupants. Myth #2: Complaints about rooming houses come from a vocal few. Absence of complaints does not equal absence of complainants. In any event, I am hearing from homeowners all over the city, many of whom have given up on the complaint process as they realize that it goes nowhere. There seems to be some collective numbness amongst the homeowners who have been told all sorts of nonsense by city officials over the years. Surprisingly, the supposedly “unconstitutional” zoning law has now been declared “constitutional” by city officials (we heard it from the mayor during the city council meeting) but renamed “hard/impossible to enforce.” The home owners are now waking up as they find they are not alone. Myth #3: We should go after the “bad apple” landlords who are few in number. By all means, however, that will not solve the problem of illegal rooming houses which are omnipresent in the city. Not all of these illegal rooming houses are problems in the sense that they produce noise, litter, etc. They are problems in that they change the character of the neighborhood by their innately larger footprint (see Myth #1 above) and their distortion of the densities for single family neighborhoods. At one time, I had four illegal rooming houses on my street of 12 homes and I can say that the nature of the neighborhood was drastically affected by their mere existence regardless of the presence or lack of nefarious behaviors of the occupants. Myth #4: We should use other city code violations to deal with the problem. This is a corollary to Myth #3. The problem being illegal rooming houses, I hardly see the effectiveness in giving disorderly conduct, noise and litter citations to the renters as the solution. The illegal rooming house remains even though the renters, sufficiently chastised and fined, may be quieter and more circumspect in the future. The citations do nothing to reduce the excess number of individuals living in the house. Myth #5: Enforcement of the code on illegal rooming houses is too difficult. This is an interesting concept since real enforcement has never been attempted. At present, the enforcement falls on the police department, which, as the Chief of Police has pointed out (and rightly) has a lot of high priority police actions and not enough personnel and money to get it all done. If we change the primary objective from enforcing noise, litter, parking and drinking violations to the elimination of illegal rooming houses, the burden on law enforcement is reduced. It also allows us to use code enforcement personnel or inspectors who are not police officers and really do not need to be under the police department at all. However, I do believe it is incumbent on the Chief of Police, as well as the heads of all city departments, to work together to find creative solutions to the enforcement issue. The mayor should be the driving force behind this. This is just not so, in spite of the pap that the citizens of this city have been fed for the last umpteen years. In a miraculous epiphany, the mayor made a pronouncement during the meeting by declaring the law to be constitutional. Many cities across the US have successfully defended their zoning laws in court, which, by the way, is the ONLY way a law can be declared discriminatory, illegal, unconstitutional… All else is pure speculation. Myth #7: Illegal rooming houses exist because there is little low-cost housing. Well, they got this one right, partly. They exist because the city has allowed them to come into being instead of enforcing the code. This certainly takes the pressure off serious movement toward creating low-cost housing. The city has treated its low density neighborhoods as de facto sponges, allowing them to absorb more and more residents to ease the housing crunch. This acts as a kind of a larger, stealth version of the accessory dwelling unit (ADU), another bad idea whose time should never have come. At some point, notably now, the resident homeowners realize the ploy and object to the surprise of nobody but the city executives, candidates for office and some council members. One commenter opined that we needed these rooming houses for our low income renters, such as the elderly and single mothers with children. I have yet to hear of any illegal rooming house with four or more retirees or single mothers. Myth #8: The Campus Community Coalition (CCC) can solve the problem of group rentals. As much as I believe the Coalition has provided an excellent educational venue, it cannot resolve the issue of illegal rooming houses in Bellingham. (For the record again, I am a member of the CCC.) Its efforts may attenuate some of the problems associated with drinking and other objectionable student behaviors, however, to look at this as a major means for dealing with housing is extremely problematic. Even the statistical measures of the CCC’s achievements can be called into question. I have spoken about these data with the director of the CCC on several occasions. The group relies on many statistics, made available primarily by the police department. These figures were never designed to provide statistical support to or confirmation of reaching the objectives of the CCC. For example, a reduction in the number of 911 calls for loud parties could indicate that there are fewer bacchanalia or that fewer neighbors chose to call in, knowing that the likelihood of enforcement is low due to higher priority calls. Without reliable, relevant numbers, you are swimming in a miasma of information. Myth #9: Enforcement/licensing will increase the bureaucracy. Perhaps. The degree depends on the manner in which you structure the response to enforcement of the code on illegal rooming houses. In 1980, there were only about 46,000 residents in Bellingham. Today we are over 70,000. Although we do not have to see a proportional growth in city government, it stands to reason that in some areas we must accept a larger municipal structure to deal with issues that were not present a quarter of a century ago. Last night the tectonic-like crust, which had formed over the city council regarding the issue of illegal rooming houses in Bellingham, ruptured when a motion to create a pilot project on the enforcement of the law was passed 5-2, with Mr. Watts and Ms. Ryan voting against. (To see the Herald article on the meeting click here) Spearheaded by council member Terry Bornemann, the council shook off the crustal dust and listened to its constituency, the residents and homeowners, who have long endured in silence. The worn-out arguments of the landlords (e.g. it’s only a small number of property-owners who contribute to the problem) were recognized by most to be unfounded or over-stated. (I will review those arguments in a subsequent blog). Moreover, the city’s written response to the council on its actions regarding the illegal rooming house issue (click here to read the document) proved again that the city was nibbling around the edges of the problem as enforcement of the single family zoning code was, curiously, not even mentioned. An undercurrent to the discussion on the issue of illegal rooming houses finally floated to the surface. I wrote on this "floater" in previous blog entries, however paradoxically, only the landlords and the “landlord” attorney who commented, touched on the issue last night. There is a massive affordable housing shortage in Bellingham whose safety valve has been, until now, illegal rooming houses. The city must get off its collective duff to deal effectively with not only the creation of illegal rooming houses but also the influx of new residents and projected increases in the student population at WWU. If not, all talk of preserving neighborhood character and controlling growth and sprawl is illusional.